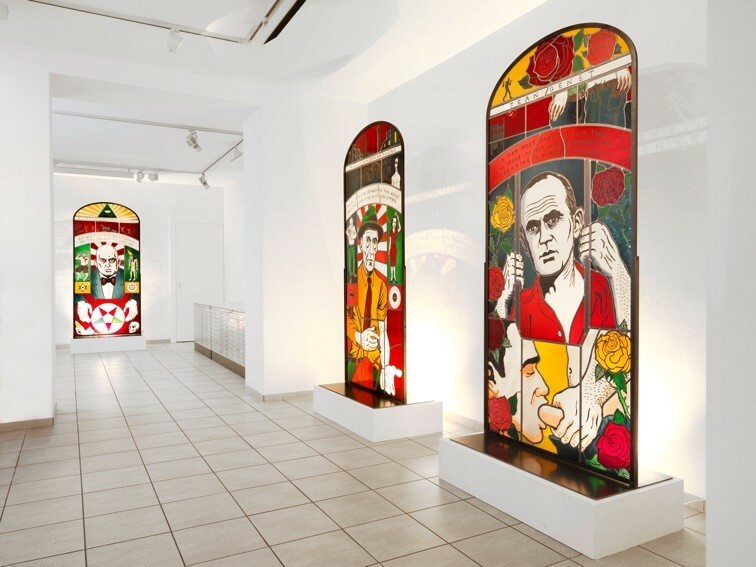 When they were exhibited at Daniel Blau gallery in Hoxton Square last year, Neal Fox’s stained-glass portraits stunned – both on account of their seamless execution and outspoken take on fame-culture. Constructed using traditional glassware methods, each tells a graphic tale of celebrity, depravity and excess through colour-block panels punctuated by quotations from some of the twentieth century’s most polemic literary figures, including Thompson and Burroughs. The figures appear consecrated, fixed and permanently secured as pseudo-religious icons and in their stasis, stand entirely opposed to those depicted in the artist’s latest work, ‘Wild Frontier of the Mind’. The vast seascape sees the artist make a return to illustration proper, to those slightly distorted, gargoyle-y, tri-tone line-drawings that first won him fame. All the Fox regulars are there of course, in addition to many new faces, and set adrift on an ocean of sexual expoits, chemical warefare and alien invasion that sees Freud, Jung and Captain Haddock battle the Monster of the Id; Charlie Sheen escape the prison of the Super Ego and Picasso and Francis Bacon attacked by nightmarish semiotic phantoms. “I watched a film called Magic Trip about Ken Kesey and the Merry Pranksters about being pioneers on the frontier of the mind. I was also reading J G Ballard who had also spoken about going on a mind safari. I’d abeen getting into old comics by a guy called Basil Wolverton, who drew really cool science fiction stories like 'Brain Bats from Venus'. It all went into creating this work that seems pretty insane but certainly made sense at the time, " Fox explains.